Education technology is growing by leaps and bounds, supported by an immense amount of credible research and backed by robust engineering. We’ve spoken on this blog before about how education technology tools and platforms are not just for the elite, but that the simplest of tools can help marginalized students learn better. But as any teacher in an underfunded school knows, making the case to purchase the latest piece of technology on the market can be an uphill battle. Assessing the needs of your classroom, comparison shopping for the most cost effective option, ensuring that it will be useful over the long-term are all just the first few steps to convincing school administrators to make a purchase you just know will empower your students. It is often a long drawn out and exhausting process. 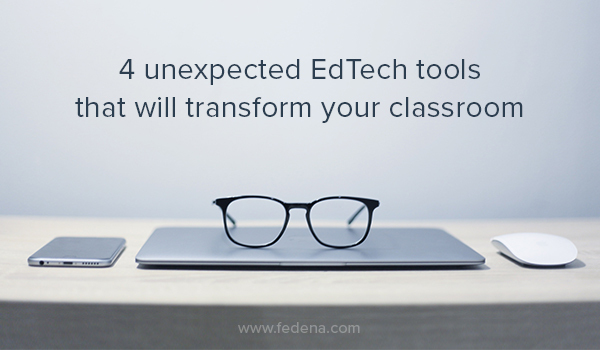 So here are a few existing tools that are not necessarily built for the classroom, but are as effective as that best-in-class dream tool you have been eyeing for months now. Working with Google Docs for a group project is one of the most fulfilling experience your very particular students are going to thank you for. Its auto-save option is perfect for the absent-minded kids, while it’s multiple person edit feature allows for seamless real-time collaboration. The best part is that it’s continual archiving enables you to see who really contributed what in that report you assigned – enabling you to better help students who might be flying under the radar and lagging a little behind their peers. These features can be found across most Google Apps features – from Slides for presentations to Sheets for some organization or analytical assignments. Struggling to get your students to pay attention to their language lessons out of the classroom? What better way than to gamify it. Duolingo is one of the most popular language learning apps out there, and there is nothing stopping it from being a fun five-minute game your students play on the bus on their way to school. While it certainly is not a replacement for in-classroom instruction, it makes for a handy supplementary tool perfect for practice – one of the most vital elements to perfect learning a new language. This is by far one of the most under-rated education technology tool in the market. A big part of learning is communicating the information absorbed to an audience. Even the most enthusiastic listeners can be distracted when confronted with a dull and static powerpoint presentation straight out of the 90s. As a savvy teacher, you know that communication and presentation skills will stand them in good stead for their college career and their professional lives after. So why not give them a head start? Prezi is a presentation tool that allows students to easily create highly dynamic and engaging presentations. Using this educational technology tool will not only encourage your students to think about how to best communicate their ideas but also about how to use good design to their advantage. Let’s be honest with ourselves – the best education technology tools stand defeated in the face of the multitude of distractions our students have to cope with. Whether it is a notification about their favourite singer tweeting or the latest meme going viral or a fight brewing on the group chat, work and pleasure are intermixed in our increasingly connected world. Tools like StayFocused enable students to be online but still stay productive by blocking certain distractions for pre-determined periods of time. Deploying tools that help you focus early can only train young brains to remain on task more easily. Let us know what are the other education technology tools you like to use!